When you are in the market for a new fan, the tower fan vs pedestal fan (stand fan) debate can make it difficult to choose which fan is best for you. 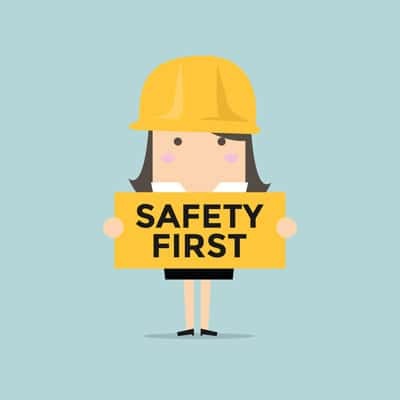 If you find yourself struggling to make the correct decision about which fan is best for your living situation, be sure to read on and watch our video to learn more about the pros and cons of each so that you can make a truly informed decision. The good thing about pedestal fans is that you are able to control the direction of the airflow much better than you can with tower fans. You can adjust up and down, left and right and often you can control the tilt of a pedestal fan. This gives you a lot of control in terms of where you want the airflow to be directed. With stand fans this is important as the purpose of these fans is not to cool down your room but to blow air on the people in the room. So in terms of control, a pedestal fan has more options as the height of the tower fan cannot change, and very rarely do tower fans have a built-in tilt feature. Another tick in the pedestal pro box is the actual airflow area. More often than not the actual area where the air is coming from is much larger. What you see is what you get with pedestal fans. You know exactly where the airflow is coming from. However, with a lot of tower fans, the actual space where the air is coming out is quite limited and often quite deceptive on the first look of the fan. Because of the larger blades and aforementioned fan area, pedestal fans are much more powerful generally than tower fans which makes them far more useful in larger spaces. This fairly generic pedestal fan is listed at 1854 CFM oh high setting while this popular tower fan is listed as 720CFM on high. Obviously different models may vary but that should give you a rough idea of airflow. In an office, you are likely not so worried about decor as you would be at home so pedestal fans are a better choice. Offices generally are larger than your rooms at home so therefore you will want a fan with more power and more control over airflow. Given the above points, pedestal fans are the better choice than most tower fans for larger spaces. Pedestal fans are not always used by business owners or homeowners who truly value the motif of the space, as pedestal fans can become a bit of an eyesore. They are usually only deployed by those who do not care about appearances and are looking to save a few dollars on their ventilation needs. The pedestal fan tends to draw attention wherever it is used but in a more negative way. While the pedestal fan can be perched in a number of spots, this only serves to disguise the fact that they cannot be used in tight spaces, because of their inability to power down. Those who utilize pedestal fans are left to aim and point the device in the directions that they wish to cool, without having a great deal of control over the process. A pedestal fan allows for far more air to circulate in a certain area, but the pedestal fan also does precious little to improve the quality of the air that it is responsible for circulating. If one of your primary objectives when purchasing a fan is to improve air quality, the pedestal fan is not going to be your best choice, instead, you will want to look at a tower fan with an ionizer. As like most fans, the more powerful the fan, more often than not, it will mean more noise. 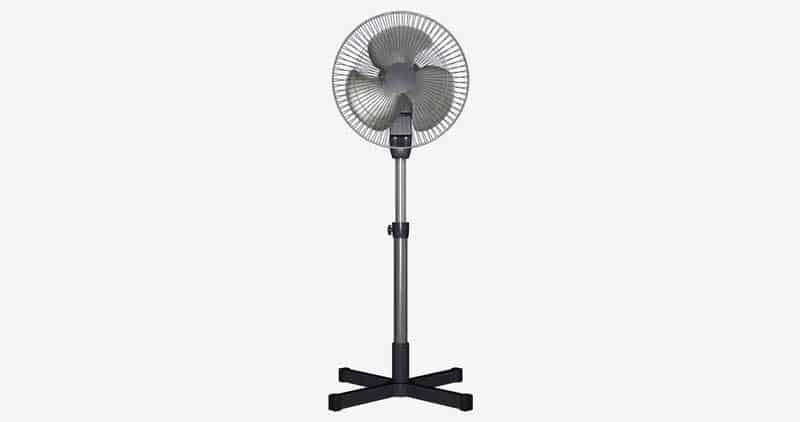 Given that pedestal fans generate a larger amount of airflow, they are also generally noisier. If you have kids and/or animals around the house, pedestal fans are much more susceptible to being knocked over given their tall and not so steady base. Along with that, the blades of a pedestal fan, although encased by a grill usually, still leave room for fingers or small items to get entangled with the blades through the grills. Dyson offers bladeless pedestal and tower fans which alleviate this problem, but they are expensive. If you don’t want to deal with a long dangly cord that has the potential for people to trip over, then a pedestal fan may not be your best bet. 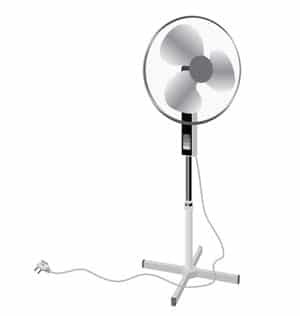 Often, pedestal fans have the power cord running right up to the middle/top of the fan which leaves the cord dangling down to the floor as in the picture to the right. Other fans do not provide the customer with the same freedom of choice as the tower fan. They come in a number of varieties with a plethora of pricing options, which is what the modern consumer has come to expect in these instances. Even the most basic and inexpensive models come with a multitude of features that allow you to personalize your settings. The pedestal fan tends to only work best in one type of space or enclosure and for those who are seeking a fan for their small to medium spaces, they can fit a tower fan into the corner of any room and still enjoy the same air circulation that a more cumbersome fan would provide. There are also a number of settings and speeds that give the fan owner a chance to settle into a mode that is most comfortable to them. If you are in search of a fan that can fit in limited spaces, the tower fan is your best choice. The base is generally not as wide so they take up less space and they are much shorter than their counterparts. Tower fans are a bit more versatile in terms of features and there are a lot of features you can get on tower fans that you won’t find on pedestal fans. Also on a number of tower fans, there can be a variety of different speed settings. For example a breeze mode, or sleep mode which changes the amount of air coming out of the fan automatically. If you suffer from asthma or allergies some believe that an air Ionizer can help. Along with the above, there are said to be many other benefits of ionizing the air. There are a number of tower fans available that have an ionizing feature built into them so you can enjoy the benefits. All the moving parts/fan blades are well encased in the units so there is very little chance of injury. This is great if you have pets and animals running around the house as you won’t need to be concerned. Also, tower fans, most of the time, have more steady bases, so are much harder to knock over. For the most part, pedestal fans all look like a pedestal fan. Tower fans, however, come in many shapes and forms and have more chance of slotting into your decor (more) seamlessly than a pedestal fan will. Should you find that you have too large of a space to cool, then you will need to invest in a portable air conditioner or an evaporative cooler that allows for more raw power that is actually controllable or an air circulator. Otherwise, you are left with poor air circulation and a fan that does not get the job done. A tower fan or pedestal fan are not air conditioners. Most tower fan models are quiet and easy to keep in a house with small children, while others are not. This is why it is important for consumers to pay close attention and ask plenty of questions before making a decision on which model to purchase so that they are not forced to make an exchange at a later date. Some of the more powerful tower fans are quite noisy however as mentioned in the positives, there are often features on these tower fans that tip the balance in favor of these tower fans, depending on what you are looking for. Some models may not possess the proper durability and when you make the wrong purchase, you could end up spending more money over the long haul. Be sure to choose the correct tower fan, so that you can save yourself the time and hassle. Unlike pedestal fans, you don’t have a huge range of control over where the airflow direction is going. Yes, they oscillate, however, there is generally no side to side or up and down adjustment of the airflow direction. You would have to move the fan unit itself. There are one or two tower fans that offer a minimal amount of control over the vertical airflow direction, however, it does not have close to the control pedestal fans do. Like many things, there are pros and cons to each decision in regards to a tower fan vs a normal fan, but you can come to a more informed decision by thinking more specifically about what you want the fan to do. 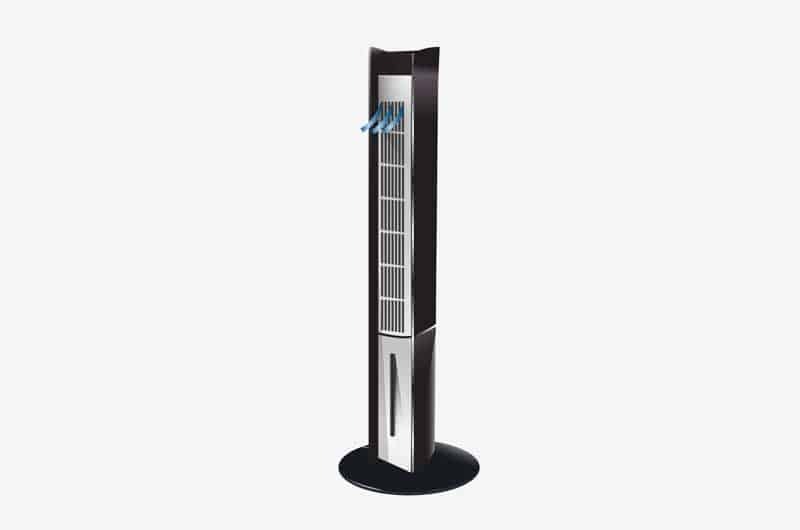 The primary difference between tower fans and pedestal fans is the amount of air flow output and the design and features. While pedestal fans tend to be more powerful, tower fans are more practical to place and tend to have more available features. Hopefully, this guide has given you a bit more of an idea of where to start, or you can also check out our tower fan vs box fan breakdown along with our window fan vs box fan and air circulator vs regular fan guide. Feel free to leave ask a question or leave a comment below. Great discussion. In my opinion for apartment dwellers or those looking to cool smaller rooms, tower fans are a great option. Their slender design allows them to fit in tight corners, while still providing ample air flow. Because pedestal fans have large blades, they are typically capable of cooling larger rooms. Thanks for the comment. Yup Tower fans also have a lot more variations in styles which enable them to fit with your decor a bit better. For the most part a pedestal fan looks like a pedestal fan, but Tower fans can look quite stylish ie. Dyson AM Range, Sharper image. Which one uses more electricity? TLDR: There is not a lot of difference and it will vary from fan to fan. There are many factors at play to determine which fan uses more. There is a good comparison chart here It will also vary from fan to fan and you will likely find tower fans that use more wattage than some pedestal fans and vice versa. For example the Vornado 153 we tested uses only around 53W on full speed however the Lasko 4443 uses up to nearly 90w. The Lasko 4443 is far far more powerful though. If you are really interested I suggest checking this article out. though its about ceiling fans, a lot of the same principals apply. Thank you for your comparing article I’m thinking of choosing a tower fan or pedestal fan. Maybe I will choose a tower fan for my family!